The housing type under scrutiny for the making of this prototype is the semi-open courtyard block. The study of Pearl Bank Apartments (designed in 1976 by Tan Cheng Siong in Singapore) prompted the design research for this particular form of housing. The 38-storey habitable wall, surrounding an open void facing west, still stands as one of the largest slip-form structure performed today. A sequence of radiating shear walls, organized in a 270 degrees shoe-horse plan, breaks the dominance of the horizontal datum, only to reconfigure it vertically into a three-dimensional puzzle of varied townhouses in the sky. The search for an alternative intramural living sets the point of departure for the prototyping of the column. A first experiment was to conceive a hollow and open column (300 deg. shoe-horse plan) whose thickness gradually changes in cross-section, to support a variety of living units. The main housing intention is to introvert living by directing the unit types towards the central open void. While the outer surface of the column is left plain and untouched, the inner surface, in contrast is highly articulated. A full solar radiation analysis on the inner surface of the voided column guides its material, spatial and structural definition. By analyzing the solar exposure that the void receives (from top and west) over the course of one year in Hong Kong, zones of changing light intensity are mapped on its inner surface. Two fractal lines located at bottom and top profile of the column respond to the colored radiation map by recessing inside the original thickness of the column and by protruding outside of it. That is, the areas showing the highest heat gain receive greater surface definition while the passive areas remain flat. This method produces a heterogeneous sequence of vertical channels, maximizing the amount of shaded spaces for living, desirable in this sub-tropical climate. Improving from the formwork procedure of column 2, the technique created here is only one-step process and bypasses the intermediate rubber casting step, even if undercuts in the surface articulation are still present. 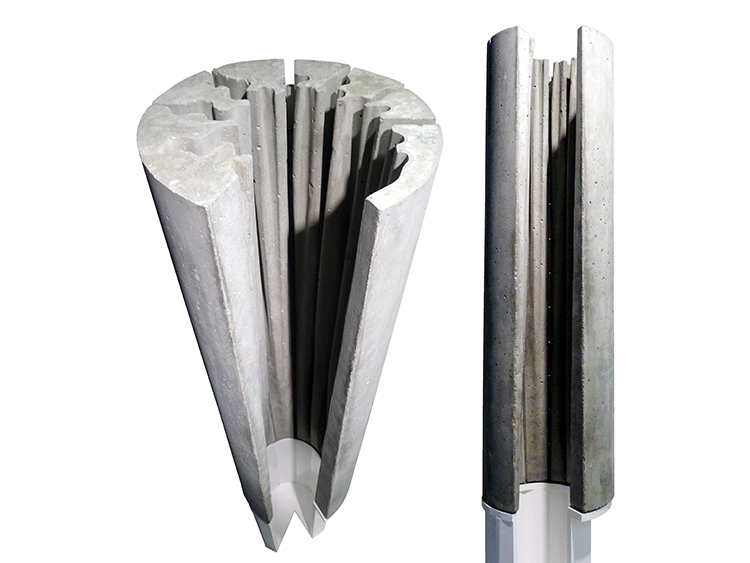 To account for the issue of mould release, triangular gaps are introduced in the top and bottom hard profiles to allow movement of the corrugation when releasing the formwork. Further developments of the prototype will address how to conceive a slip formwork that can be reconfigured at each climbing steps to progressively adapt to the varying channeling lines generated for the inner wall of the void.